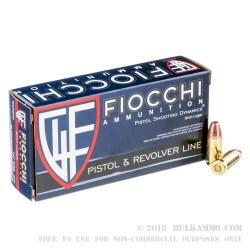 Fiocchi Ammuntion produces some of the most popular rounds for American shooters. They’ve been in business for more than 100 years and with over a century of experience behind them, they have taken handgun ammo to a whole new level. The Fiocchi Pistol Shooting Dynamics line up was developed more than 25 years ago to ensure that pistol shooters had a high-quality ammo, available at an affordable price, in multiple different configurations. 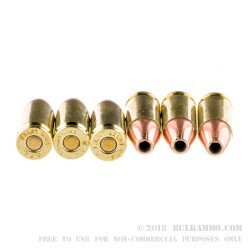 They currently offer FMJ or Full Metal Jacket, TMJ or Total Metal Jacket, Frangible, EMB or Expansion Mono Block, Extrema XTP Hollow Points, CMJ or Copper Metal Jacket, various other Hollow Points and Soft Points, and new loads are always being developed. 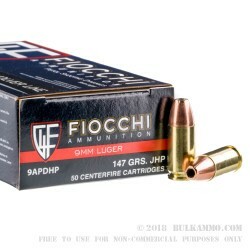 These Fiocchi 9mm copper Jacketed Hollow Point rounds are 147 grain and are loaded into high quality, brand new, thick walled, non-corrosive, Boxer primed, reloadable brass cases. They are built from the factory to be Subsonic with a muzzle velocity of about 1000 feet per second. The heavy duty 147 grain hollow points have 310-foot pounds of muzzle energy behind them, so when they find their mark, they really make an impact. These rounds come in a box of 50 rounds so you can load 2 or 3 mags for your perfect concealed carry set up. Get yours today and see why so many shooters love the Fiocchi Pistol Shooting Dynamics line.